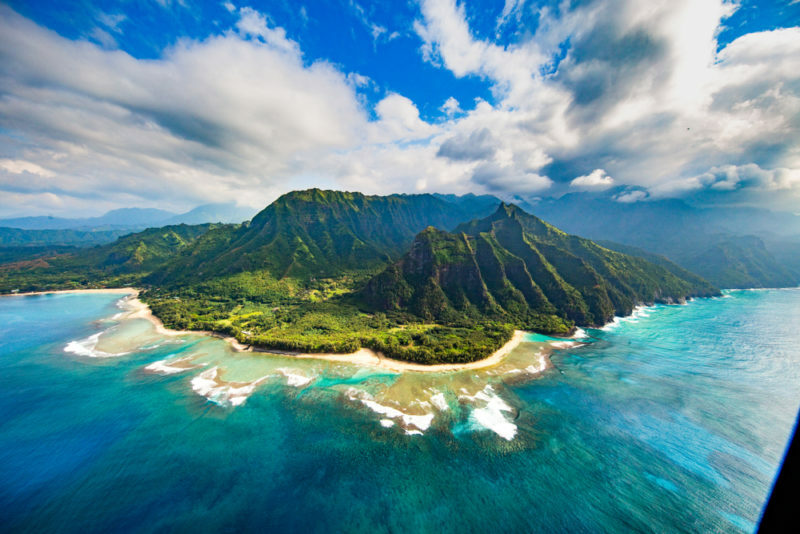 One of the biggest must-see views of Hawaii is on Kauai: The Na Pali coast. As Hawaii’s oldest island, age has allowed the coast to develop into tumbling cliffs with a mix of deep reds and emerald greens. It’s a place where mountain ridges and valleys give way to secret beaches and the unending Pacific Ocean. Needless to say, it is gorgeous with an ancient, almost haunting quality to it. 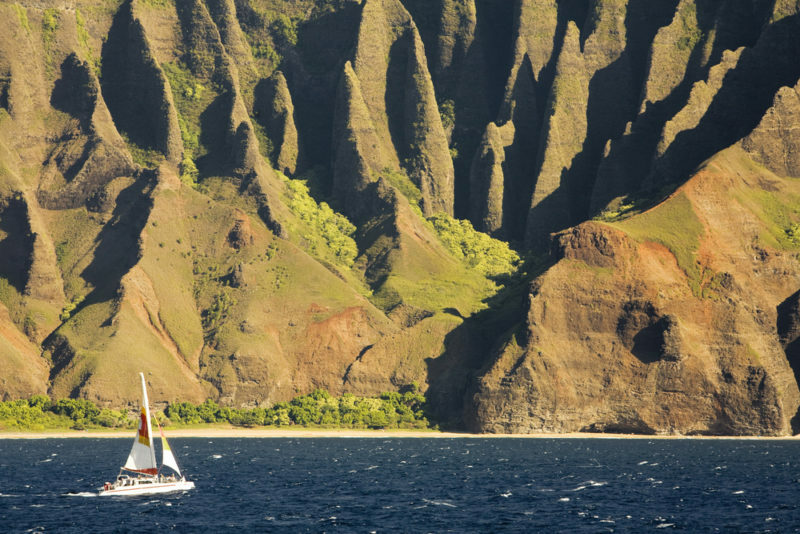 Na Pali coast tours are the best way to really get to know this part of the island. 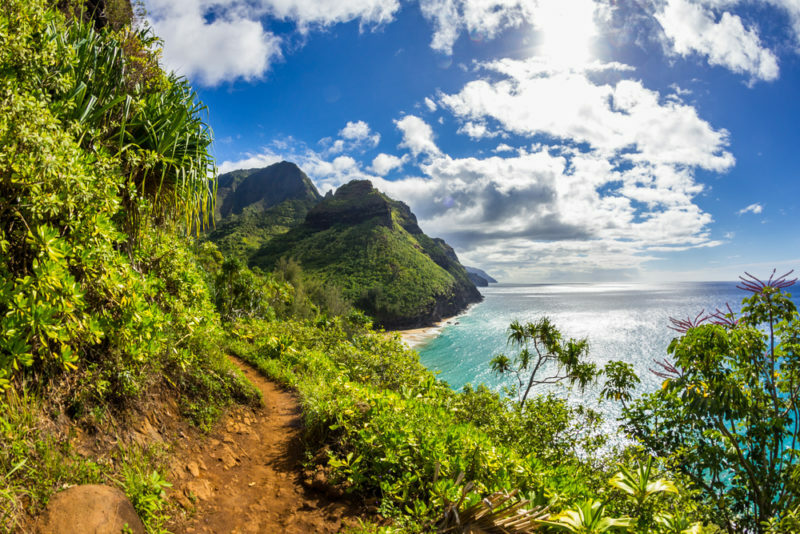 Boats and helicopters are popular, but there is also the Kalalau trail for those with more adventure in their hearts. Read on to find out more about Na Pali and I hope you get to visit these magical cliffs one day. 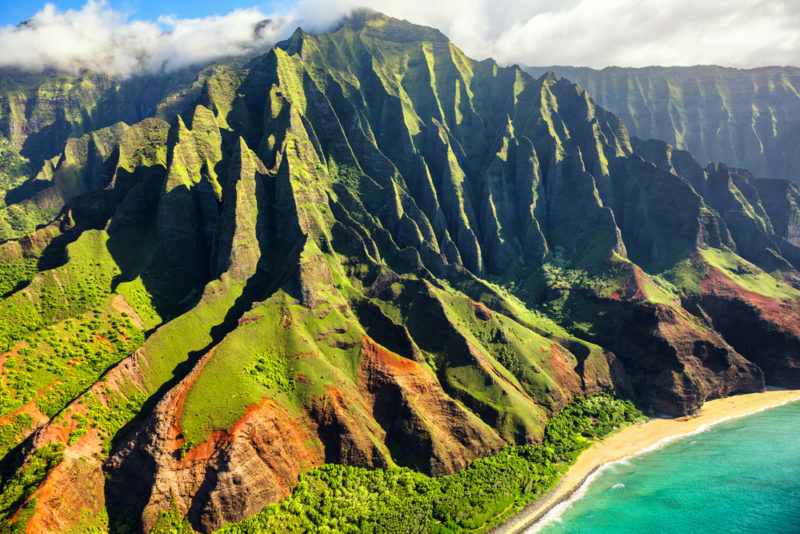 To really get a feel for how ancient this island is, Na Pali coast tours such as a helicopter ride are great if you want to see the Na Pali coast and then some. Not only do you get a magnificent bird’s eye view, but you can see the steep cliffs and mountains in its entirety. The rich greenery of the rainforests paint a luscious jade against the backdrop of the deep reds and browns of the dirt and rock beneath it. The physical details of this large, natural treasure can be seen so very clearly that it beats any photo ever taken. Its incredibly easy to imagine the ancient Hawaiians who survived here with only their crops and their catch from the sea to depend on. If heights aren’t your thing, then the Na Pali coast tours by boat are also a fantastic way to experience the coast. Looking at the coastline from bottom up, you’ll get the chance to cruise along the coast and into crevices depending on sea level. You’ll also have a much better (and closer) view of sun-basking Hawaiian monk seals and jumping whales during whale watch season (November – May). But the best part is probably that because of the much slower pace (compared to the helicopter), you can really sit back and enjoy the view of the Na Pali coast with friends and family alike. If you’re a hiking junkie, then you’re probably reading this to find out more information about the Kalalau Trail for the Na Pali views. Roughly 11 miles long, this is a hike for those who know what they’re doing and have done their research about this spectacular hike. It is considered dangerous, but extremely rewarding with its gorgeous views of sky, rainforest, cliffs, rainbows, and the ocean. If you’re unsure about doing this yourself, there are a few Na Pali coast tours that feature a guided hike on the Kalalau. Local tip: You’ll need a permit if you’re going past Hanakapiai Valley (2 miles in) and they sell out fast, sometimes even up to a year! So if you plan on hiking past 2 miles, make sure to get that permit first before you do any other planning for this hike. The Department of Land and Natural Resources has a wealth of information about the Kalalau Trail. Make sure to watch the safety video they have up! Another option that I really love is a sunset dinner cruise off the coast of Na Pali! As you can guess, it is unimaginably beautiful and romantic. Holoholo Charters is a great local company to choose and the crew really takes care of you and makes the whole trip a memorable event. Here’s a fantastic video of what to expect on the Kalalau Trail by Jeff Pelletier. Keep in mind that they’re hiking roundtrip in one day, instead of doing the usual overnight camping most hikers opt to do.